The internal jugular vein is not a typical vascular access line during the percutaneous closure of an atrial septal defect. We report the closure of a double atrial septal defect with a single device, using a transjugular venous approach, in a child with an inferior vena cava obstructed by a thrombosis due to previous cardiac catheterization. That the transjugular venous approach can be used as a possible alternative during the transcatheter closure of an atrial septal defect in children, when the inferior vena cava access is not possible. Herein, we report the closure of a two-hole secundum atrial septal defect in a four-year-old girl using a single occlusion device. A transjugular approach was used due to an inferior vena cava obstructed by a thrombus. A 4-year-old girl, who weighted 13 kg, presented to our department for a scheduled follow-up for the transcatheter closure of a multiple secundum ASD. She also had a history of a transcatheter closure of a large patent ductus arteriosus at the age of 10 months, because of congestive heart failure. A transthoracic echocardiographic examination revealed two atrial septal defects measuring 12 and 4 mm, respectively, thatwere 5 mm apart. The total septum was 32 mm in length and had adequate surrounding rims [Figure 1]. In addition, a dilated right ventricle and tricuspid valve regurgitation were present, and no remarkable findings were observed in the other investigations. Cardiac catheterization was performed under general anesthesia using transesophageal echocardiography control. We originally intended to place a 5-French (Fr) sheath in the right femoral vein and the right femoral artery for hemodynamic measurements and monitoring. However, we could not pass the guidewire into the inferior vena cava. Manual contrast injection was performed in the femoral vein, and an obstruction in the inferior vena cava was observed and identified as a thrombus. Catheterization was continued by using the right internal jugular venous access with a 5 Fr sheath. Heparin 100 units per kilogram of body weight was administered, and a 5 Fr Judkins right catheter with a hydrophilic guidewire was introduced, under transesophageal echocardiographic control through the larger defect into the left atrium and the left lower pulmonary vein instead of the left upper pulmonary vein. 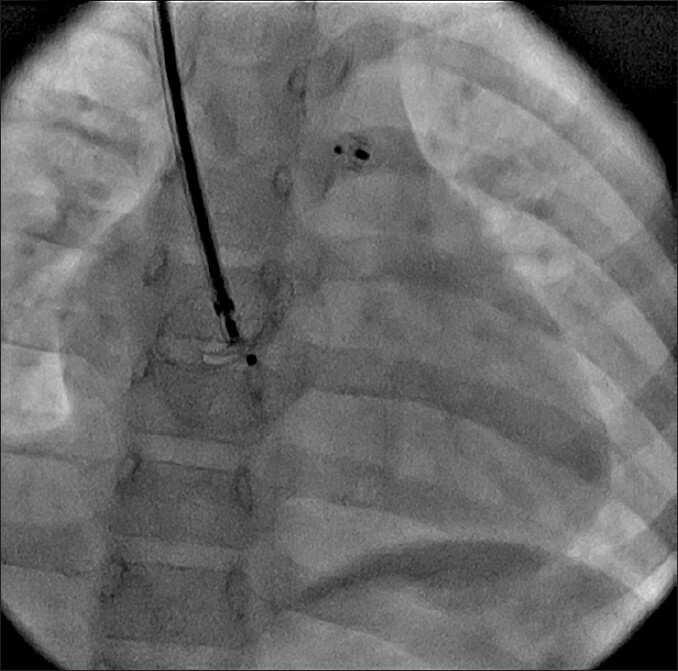 A manually curved, stiff exchange guidewire then replaced the catheter in that position, over which a 7F long sheath and a 16 mm Amplatzer septal occluder (St. Jude Medical, Inc.; Plymouth, MN, USA) device were glided into the left atrium. The left and right device discs were opened sequentially under fluoroscopic and transesophageal echocardiographic guidance, and a successful deployment of the device was accomplished after several and repeated trials, aiming for an ideal device orientation [Figure 2]. 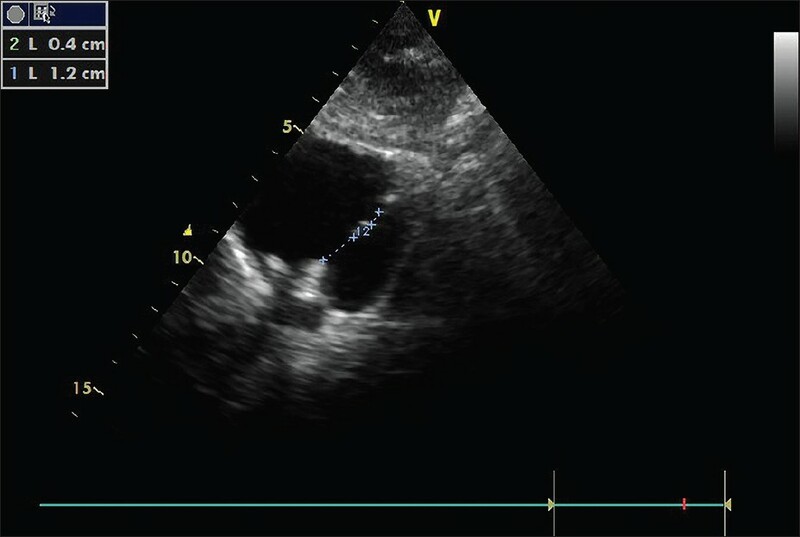 Transesophageal echocardiography revealed no residual shunts, normal atrioventricular valve function, and normal superior and inferior vena cava blood flow. The next day, a transthoracic echocardiographic examination was normal. Aspirin therapy was started with a six-month course, and a follow-up was planned for the patient. The coagulation profile tests were normal, and the patient was discharged the next day. The standard vascular access for an ASD closure in pediatric and adult patients is the femoral vein, due to the low incidence of associated complications and easier manipulation of the device compared to other access routes. However, this is not always possible if the inferior vena cava is interrupted or obstructed. Transhepatic or transjugular venous access for the transcatheter closure of septal defects has been reported. ,,,, ASD closure in a child using a transjugular venous approach is in frequently reported. Ozbarlas, et al. reported an ASD closure using a transjugular venous approach in an eight-year-old child, with an interrupted inferior vena cava and heterotaxia. The difficulties associated with the transjugular approach include placing a large sheath in the jugular vein, directing the catheter through the septum, manipulating it past the defect, and placing a catheter or guidewire in the upper left pulmonary vein. Furthermore, there is a risk of air embolism during the procedure. We preferred the transjugular access over the transhepatic access due to the complications potentially associated with the latter, including retroperitoneal bleeding, hemobilia, and hepatic abscess, which can be avoided using the transjugular approach. , We believe that the jugular approach provides a simpler and safer alternative to the transhepatic approach. The procedure was straightforward in our case. The only drawback was the slightly longer time required for the deployment of the device due to the perpendicular alignment of the discs in relation to the atrial septum and the presence of a two-hole defect that needed to be covered by one device. We thought that a single occluder would be sufficient because the distance of the the rim of tissue between two defects was 5 mm. Experience in performing the standard procedure and accessing the transjugular vein are mandatory to perform the procedure through the transjugular vein, because the direction is reversed compared to the femoral venous approach. Moreover, caution is required, due to the risk of air embolism. Otherwise, the transjugular approach is a good alternative to the femoral venous approach. We conclude that the percutaneous transjugular approach for a transcatheter ASD closure in pediatric patients is an alternative method when femoral venous access is not possible. 1. Emmel M, Sreeram N, Pillekamp F, Boehm W, Brockmeier K. Transhepatic approach for catheter interventions in infants and children with congenital heart diseases. Clin Res Cardiol 2006;95:329-33. 2. Papa M, Gaspardone A, Fragasso G, Camesasca C, Conversano A, Tomei F, et al. Jugular approach for percutaneous closure of atrial septal defect. Ital Heart J 2004;5:466-9. 3. Ozbarlas N, Kiziltas A, Kucukosmanoglu O, Erdem S. Transjugular approach to device closure of atrial septal defect in a child with heterotaxia and interrupted inferior vena cava. Tex Heart Inst J 2012;39:435-7. 4. Sullebarger JT, Sayad D, Gerber L, Ettedqui J, Jimmo-Waumans S, Alcebo PC. Percutaneous closure of atrial septal defect via transjugular approach with Amplatzer septal occluder after unsuccessful attempt using CardioSEAL device. Catheter Cardiovasc Interv 2004;62:262-5. 5. Sader MA, de Moor M, Pomerantsev E, Palacios IF. Percutanous transcatheter patent foramen ovale closure using the right internal jugular venous approach. Catheter Catheter Cardiovasc Interv 2003;60:536-9. 6. Sheridan RL, Weber JM. Mechanical and infectious complications of central venous cannulation in children: Lessons learned from a 10-year experience placing more than 1000 catheters. J Burn Care Res 2006;27:713-8. 7. Oliveira EC, Pauperio HM, Oliveira BM, da Silva RA, Alves FM, Adjuto GL. Percutaneous closure of atrial septal defect using transhepatic puncture. Arq Bras Cardiol 2006;87:193-6.